Unfortunately, don't know how this compares against what other people could achieve. With most of my damage-oriented characters I'm doing somewhere between 8-13k with no boons other than what I generate myself. My healing scourge with no offensive stats at all hits around 4k. I should add that I'm not a raider and my rotations are likely not very tight. My Deadeye old build (Full ascended berserker armor and weapons, ascended marauder trinkets, no stat bonus infusions) is hitting 9k dps on the average golem with not boons (except self fury), no weakness on target and no class buffs. Literally just first try to see how it compares approximately. Given the build is outperformed by Holo and other power builds, this puts in between your 8-13k base. EDIT: did have food and utility buff still running from raids, forgot to mention. Also something to consider: Depending on the burst of your spec, you will end up with a higher number if you test it on a 1mil golem vs a 4mil one. Why exactly you are using 'crusader' & 'cavalier' for reaper? As he's building this for solo play theirs not really a dps role. Cant really say, then, how much dps he/she should have. The stat combo question is relevant (sort of): for most late game PvE content, some combination of berserker and marauder would probably be optimal. The issue is that I typically use a single all-purpose build for all modes, because I would rather "play" than grind out gear sets for each mode. It is not optimal, but generally it is "good enough". I like toughness gear, mainly because it helps a lot in PvP modes when you get ganked, while being decent (ymmv) for soloing stuff in PvE, like soloing dungeon content. Above is strictly speaking true, as I am not building out for a raid DPS role, HOWEVER, if you assume that the community reported boonless golem DPS output is "optimal"--at least in a certain narrow sense--it gives you an indication of how effective your build is compared to that standard. It is nice to know this qualitatively, i.e. ~30-50% the DPS of "optimal" builds in my case [note: NOT adjusted for class, build, or gear]. This gives you a mental idea of the upper limits of stuff you could reasonably solo: in my case, I could probably solo the easiest content in some fractals and dungeons, but I would definitely need a group for content that is recognized as harder or require complicated mechanics. I noticed this in the discussion. If true (and can anyone confirm this? ), that appears to be a serious outlier, i.e. double what players report other optimized professions seem to be able to achieve in similar circumstances. I must confess that I try to stay out of balance discussions, but stuff like this kinda gives the game a black eye. I don't understand. Necro is like THE profession to go full on 'zerker. You guys have more hp than a defence traited warrior AND access to multiple tanky pets. Solo is basically a "dps role" for all professions really shorter TTK is queen in solo and doubly so for necro. I'd definitely go full zerker and scholars with force / accuracy on weapon. I also do not play necro a lot but I have a pretty newbie necro in my static who does 10-12k bursts in open world without boonshare. I THINK he can sustain 8-9kish if he can just stand there and dps if that gives you an idea. Power Chrono can burst for that because the Chrono profession is the reason for the meta currently. They also die really easily. So the 24k burst on the golem means almost nothing. It is nearly impossible in solo conditions. Also, Chrono is not the easiest profession to play. The above can be true. The problem is this: that I really don't like having multiple gear sets, and I am not big on minions. After playing WvW, solo dungeons, and farming Silverwastes, I felt I needed more passive sustain, which I found in Toughness. You could argue that Vitality would better synergize with necromancer shroud mechanics, but the fairly low scaling that heals have means that it is difficult to recover quickly without a full disengage [side note: had valkyrie gear at one point]. I elected to try out higher Toughness builds as a compromise, knowing that they "sucked" in the eyes of the community. The cavalier set turned out to be pretty solid, and healing is also more "efficient" with higher Toughness (note: even then, found that a small amount of Healing Power was beneficial, hence the crusader gear). The minions issue is more of a personal thing. I find that they just are not very effective in any type of PvP, and even in PvE, I find that I really need to run other utilities on the bar (shouts, signets, spectrals) to fit my play style. I do slot in minions in some circumstances (mainly Golem) when I know that I will need to do a lot of tanking. I'd never argue against "preference." This is a game and definitely personal preferences in content that does not affect others' enjoyment are #1 reason to do anything. That said, the reason I talked about that was basically sometimes people do not realise how EASIER they could have had it. If you have played a berserker necro with good damage runes and sigils and dislike it, it is 100% fine to go whatever you want as long as you do not think that you'll be effective in raids or fractals with that (and I'm pretty sure you do not think that at all). What is considered to be bad by the community usually assumes the optimal conditions for a Machiavellian result. So I wouldn't take "this is bad" comments seriously. The only problem is then it is not easy to give you a benchmark. I can only speak about benchmarks I have experience in - and I have always used glass cannon stats in solo. Considering all these, though, 4800 dps seems pretty alright considering that is above the average I see in squads for open world. There are usually 5-10ish people who do high numbers and rest do 2-4k in open world squads against scaling bosses. This is most probably using "farming builds" though, geared towards getting the highest number of tags, so take that with a grain of salt. Yes, i can certainly burst for 15+K without might stacks. Due to the prevalence of scourges in WvW, I actually played for a while with the express aim of no boon generation (no boons=nothing to "rip" or "flip"). Interestingly, it was actually pretty fun. The old Onslaught increased your shroud AA without the quickness boon, and I slotted fully traited Signets: Spite, Locust (for speed and heals), Vampirism (good for brawling). Yes, it is kind of interesting to try and see what your DPS is without oustide help on the golems. 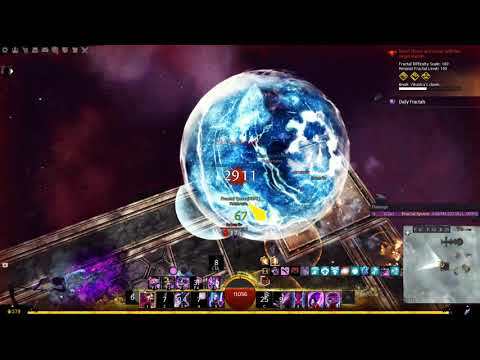 I understand that the "raid buffs" package of standard boons is almost always assumed in testing for good reasons (heck, the golem area is for raiders and raiding parties), but I spend 90+% percent of my time solo (either PvE or roaming WvW, and unranked sPvP you can make a solid argument is solo play if you don't have voice chat enabled), so it is good to know what you are capable of in sustained combat. Disclaimers: I'm a semi-casual player who's just recently made it to scale 100 in fractals, never have raided and who has slow reflexes so my rotations are likely not really tight. Also this is pre coffee so with more focus I'd probably do a bit more. I kittened up a lot of chains due to it is being morning for me. Condi Chaos Mirage (full Viper) on average golem with 1 mil HP 9k; Power Soulbeast (Berserker Assassin mix) on average golem with 1 mil HP 12k; Power Staff Daredevil (full Berserker) on average golem with 1 mil HP 9k; Power Dagger Deadeye (full Berserker) on average golem with 1 mil HP 8k. I suspect about 40% more of these numbers would be the standard. I usually end up at 30-45% lower than the high end raiding group benchmarks. It is nearly impossible in solo conditions. What I mean is REALLY good players with really good setups and a lot of experience are not benchmarks. I probably should have said "nearly impossible for most of us" instead of "nearly impossible" to be fair though. I also would like to see what traits you use. Would be really helpf. And on a side note, you cannot expect to have the same gear set for all modes. It just wont cut it. Sure, open world pve isnt an issue. But it will become an issue in fractals, for example. Necro is a class with a huge healthpool, great survivability. Hence why most people - myself included - run full zerker, at least in pve. Wvw is another thing altogether, as there is a certain armor threshold people dont cross cause they sacrifice too much dmg. Toughness is useless in wvw anyway, with the huge powercreep that we saw with PoF, and high toughness means you hit like a wet potato, while getting downed from the big bursts of thieves/spellbreakers/mirages. That being said, you should play however you like. Cheers! On that, we can probably disagree. For the most part you can expect the same type of results, BUT whatever the results, they will NOT be optimal for the mode you are in--regardless of mode--if you are using an "all-purpose build". For example, if my DPS results are 50% of optimal class averages using a single, defensive build, then I am actually quite happy, because I should get pretty similar results regardless of mode, and I don't need to grind any other gear. Bear in mind, my burst is much higher than the DPS, so I can still be relevant. I also would like to see what traits you use. Would be really helpf. And on a side note, you cannot expect to have the same gear set for all modes. It just wont cut it. Sure, open world pve isnt an issue. But it will become an issue in fractals, for example. I just started doing fractals (quite literally). I think I will be able to solo Fractal 1 in the next day or so. I plan on playing them solo for now. Ditto with Dungeons (I solo'd AC story mode, to include the cave troll that everyone seems to skip). Necro is a class with a huge healthpool, great survivability. Hence why most people - myself included - run full zerker, at least in pve. Wvw is another thing altogether, as there is a certain armor threshold people don't cross cause they sacrifice too much dmg. Toughness is useless in wvw anyway, with the huge powercreep that we saw with PoF, and high toughness means you hit like a wet potato, while getting downed from the big bursts of thieves/spellbreakers/mirages. I have found that I can survive power burst OK. Condi burst is a bit harder, but doable. I can 1v1 OK (certainly get my fair share of losses), but it seems like I am always on the wrong end of 1v2, 1v3, 1v4. Outnumbered fights are very difficult: I get focussed down rapidly. I find the extra damage cannot help there: too many blocks, etc. Dueling Thieves and Mesmer will typically win through attrition: they can easily reset and shadowstep/teleport back, or go full stealth. Eventually, they will whittle through any sustain, and I can't flee. The absolute hardest counters I have seen are Soubeast with bow and full ghost DE. If I don't have a +1 for those, I am dead. Power reaper would be 16-17k without adjusting the build for solo play. Could be higher with adjusted build. Condi Holo pretty much the same. Condi builds are usually better without boons since they dont suffer that much when not at crit cap. Condi rene should be pretty good aswell. Well nothing comes close to the broken abomination power chrono. It's not that hard to play tbh. Just CS the signet and use utilities off cd and win. Enjoy extremly high self alacrity and quickness while just doing a damage rotation. It is rather unlikely that we will ever see solo benchmarks equal to those used for raids nowadays as there is little need to and interest in completely min-maxing solo build damage for PvE at the current point. Thus there are no "typical" numbers unless we consider really bad ones outside of a few rare cases. It may become a thing if we ever see permanent challenging solo content if you use the seasonal content and some of the build guides it spawned as an indication. All though, that often came down to "easiest" rather than "best" or anything like "highest DPS". That said, I think powerful solo builds are a lot easier to accomplish than it used to be. Might in particular has been given out quite freely to all elite specs. Fury is achievable one way or another. There are a few builds I could think out of my head and how to change things around to make up for the missing boon supports and everything they'd usually provide you with. But that's pretty much all I'd bother with and that seems to apply to most players. You are already able to solo almost anything by just playing a boonless META DPS or at most by adjusting a thing or two on the fly. There is also the fact that people seem to value mobility, though less important with mounts, or defenses more than simple damage in solo content. Suggested Open World builds on Metabattle always have some combination of damage, defenses, mobility and self-boons. Figuring out the potential DPS of PvP or WvW roaming builds seems pointless to me, or at least anything on the golem. There are too many variables and different situations whenever enemy players are involved to make that anything but a waste of time. For solo reaper go marauders at least. Good damage and solid bulk. Heh. Even when I'm trying to do sort of optimal rotations (optimal for the build I'm using) on my Tempest, putting all my guts into it (like, including FGS into mixture, adding bursts of damage from signet of fire etc), I'm end up somewhat above 4k dps on an medium size 1mil hp golem. Now, I'm pretty sure I'm running "sub-optimal" build (it's created to be fun to play, first of all). It's a hybrid, which boosts power AND condi damage (as I don't want to play an one-trick Fresh Air / Air overload build, or something with high precision/ferocity to run around spammin Air autoatack non-stop - too repetitive to be fun, for me), with some Vit added (some armor items are Carrion-titled, that's +Condi +Vit +Power; I end up with 15k hp) and a lot of dodge regeneration (Adventurer armor runes which give power and condi, but also 50% stamina restoration on using Heal skill, plus Superior Sigil of Stamina in my weapon; the 2nd sigil gives me 25x10 power from kills, but it doesn't affect tests on the golem) - as I'm using dagger/dagger as weapons and often end up too close to crowds of mobs. I spec Fire and Earth, Fire for offensive boosts (with Pyromancer's Puissance to build up Might stacks easily), Earth for sustain and slight offensive boost as well. So I tried to camp Fire for some time first, to build up 20-25 Might stack - cast all weapon spells, do overload, cast a few more spells, leave a fire field, go to earth to do 2 blast finishes for more might, go to Air for overload etc. Occasionally I would summon FGS and while wielding it overload fire again a couple of times when its main dps skills are on recharge. So I don't really see any potential of improving it without changing my build (what I'm unwilling to do for now); it doesn't seem that bad, anyway. But how the kitten can I reach even those "sub-optimal" 8-9k dps others report then, theoretically? Do I really need to start abusing some specific combo repetitively to achieve this (like, Fresh Air/Air overload combo)? Or do I underestimate potential of Berserk/Maradeur armor? I mean, my current armor already gives me power and condi, it just doesn't seem to me by using Berserk I can somehow double my dps. Am I missing something? Also, I'm not using any shouts atm, still pretty new with this e-spec, and haven't tested them properly. They also seemed to me like a more supportive skills, which won't add much to solo-offensive build. What is it you are asking exactly? You are not running proper gear. You are not running recommended runes/sigils. You are not following recommended rotations. You are might stacking on the damage golem (which is not your job in a raid and even less on the golem). I can't tell how much of your build is improvised and how much is taken off of recommended builds. Going off meta is possible, if you have the class knowledge to do so. As a result of all this your dps sits at around 4k (where comparable classes hit 10-13k). And? Seems to me you spelled out the problem between your result and maximum benchmarks yourself, so how are we supposed to help? Why necro this thread for something which you answered yourself? Yes, you are underestimating the value of stats. @Cyninja.2954 , your objections would be quite solid would I be aiming to get some extreme dps values, like 15k+ Yet it seems from other statements in this topic, that even 8k dps is considered a "far lower than average". So one would expect that by simply composing a build which at least makes some sense (i.e. there is some synergy between chosen traits, the most dps-intensive skills are put into utility etc), and following some more or less sane rotations (i.e. not bashing keys randomly, using a skill which gives you a certain damage bonus depending on a certain condition after the skill which generates said condition; going through route which generate some amount of boons affecting dps etc) will generate at least that much dps. As I seem to do this all, I was wondering what is still missing. My only guess is that my stats could be lacking, but then again, I don't see how just changing Carrion to Berserk can double my dps. @Shivvies.3921 , how does it work then? I mean, I'm getting 25x10 power from weapon sigil - and you can't get more power from any other sigil, neither you can use another stacking sigil (with condi damage, for example) together with it. All my armor and trinkets pieces give at least Power and/or Condi damage, some also give a bit of precision and ferocity. It's not like I'm using armor with emphasis on healing power and vitality There are a few bonuses like that in the mix, but like that - a few. My armor runes also give me power and condi damage, quite a lot. So it seems more or less good offensive setup. By going full Berserk, I would add more ferocity and precision to the mix, is this enough to increase dps from 4k to 8k? It's just hard to believe. You are forgetting runes and might be underestimating the stat poits you'd get otherwise. Here, check this build and compare stats. This is before signet of spite (I forgot to add it). By the way, I've been playing a lot of Reaper lately, since my last comment up there, so it is not that relevant now. I can tell you, it makes little to no sense to use anything other than berserker stats on Reaper in PVE and overland. We are so incredibly tanky, and we have SO MUCH more tanky options in trait lines (just use Death Magic and if you want overkill, Blood Magic) it is a huge loss to spend your stat points elsewhere. With full Bloodlust stacks you'd have 3kish power. Power is directly proportional to your damage. And you need to crit as much as you can (preferrebly 100%) which makes Ferocity a very important stat. In any case, try a build like I linked before changin stats. If that works for you, great. If not, sorry but math is clear. Damage is tied to stats and build. If you want a defensive thing carry a few pieces of Marauder or Cavalier but if you ask me, don't overdo it. As utilities, I'd use Blood Fiend, Rise, Signet of Spite, Well of Suffering and Flesh Golem. First off, usual comparisons of dps are done with expected raid or fractal boons and party benefits. Why? Because that's what a proper group would look like and it put classes on an even playing field. 8k un-buffed might seem nice, but is actually very useless for checking group performance (or comparing rotations). As such, comparing base dps between classes is unfortunate since some (like thief) do innate high damage or others like power chrono do insane damage since they self buff a lot. Synergy between traits is 1 thing, knowing which traits make sense and are actual proper damage increases is another. Rotations are a topic to themselves, and yes, changing away from a meta or ideal rotation can already cause huge dps loss depending on class and complexity. What you are missing is basically performance from all areas: your gear being hybrid will already be a significant dps loss versus being specialized (weapon choice alone here would affect the damage since most weapon sets are either power or condition damage). Moving away from top damage traits will cause another significant damage loss. Runes and Sigils the same. Skills would do the rest. All of this adds up. This game rewards heavy specialization in pve, that's why we do not see hybrid builds except for support boons at all. Certainly no hybrid dps builds. You underestimate damage modifiers. Like i said in another thread. Most of them are multiplicative and you are probably using none. A meta build has close to 62% increased modifier damage. It also aims for 100% critchance and it comes with high ferocity. Something between 238% and 274% critdamage depending on attunement. You have probably close to 150% base critdamage and nowhere near 100% critchance. Also what do you mean with high power? Should be around 2.7k unbuffed. Thats how you do up to 5 times the damage you do right now. Condi/Power hybrid just doen't work in this game. It's probably only decent on firebrand but still worse than full condi or full power. Just tried dagger warhorn tempest on medium golem aswell. No buffs or debuffs and got to 14k. Pretty much what everyone said. So I tried to camp Fire for some time first, to build up 20-25 Might stack - cast all weapon spells, do overload, cast a few more spells, leave a fire field, go to earth to do 2 blast finishes for more might, go to Air for overload etc. Was the test done under the same condition? (Boons wise). Was the test done under the same condition? Only what my Tempest could naturally generate. Mostly it was 15-25 stacks of Might, due to the trait which gives you 2 stack of Might per each skill usage while attuned to fire, plus what Fire Overload generates, plus what is generated from comboing with fire fields and switching attunements (the later is due to Acrane traits), sometimes a bit of Fury. But, I've just tried out something closer to the build provided in my previous post, a bit different armor pieces and trinkets, but in total it's still the same: ~2500 Power (while attuned to Fire, due to traits, lower in other elements), 200% crit damage, ~70% crit chance (under Fury), a bit of condi dmg (~600) and vit (to reach 14k hp). This time I just applied to myself 25 Might stack and Fury through the console, to simulate ideal circumstances (constantly maintaing it ofc wouldn't be possible if I would have to generate those mysefl during rotations). And I just can't find a way to advance beyond 5k dps, no matter what. Whatever I do, I end up with 4-5k dps, anyway. 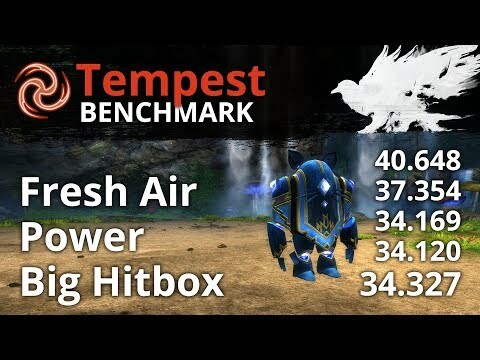 I've tried to spec Air, set Fresh Air and camp it constantly (wait for overload, do it, move to Fire, immediately back as Air is reloaded, rinse and repeat; add occasional burning from Fire Signet and some bashing from Ghyph of Storms) - still no that far above 5k dps. And as @Nephalem.8921 reported 15k dps with Tempest earlier, I just can't see how increasing Power/Crit chance/Crit damage a bit more can triple that number. I've already boosted all those quite a lot in the latest test, and have managed to get just about 1.5k extra dps only..
What kind of golem do I need to use to test it properly? So far, I've been using the smallest one, can it be that as Ele deals with AoEs mostly, I need to choose the biggest one, to measure dps realistically? You're not using quickness, allecraty, banners etc also 25 stacks of vuln are important. Try to check the snow crows website what the accepted conditions are. I believe others who reported 8-14k dps above in this thread didn't use it either. Isn't the point of the golem test to get idea of your base dps, without any boons except those you can generate for yourself? With quickness, fury, 25xMight and alacrity I indeed can reach 8-9k dps on the smallest golem - what others reported they can without all those boons. That depends on the intentions indeed. The difference between builds and players can be ridiculous tho. As an example you said that you could get 10 k with all boons while top players on dps builds can get an easy 30k. 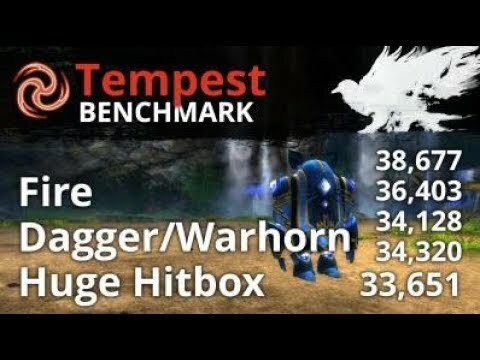 The weapons used in the above Tempest build are Scepter/Warhorn. Dps achieved is 40k initially with drop off to stable 34k. My bad, that's what one gets for answering pre-coffee in the morning. usual class buffs are: Warrior power and precision banners and empower allies, ranger frost and sun spirits with spotter. For power builds.